Today I’m linking up with Deb from Debruns for her Wednesday Word weekly linkup. This week’s word is organize. I’m also linking up with Rachel from Running on Happy, Susie from Suzlyfe, Lora from Crazy Running Girl, and Debbie from Coach Debbie Runs each week for Coaches’ Corner! If you’re training for a goal race, or planning a “racecation”, you have to be organized. Not only will it make your life easier, but it will save you a lot of time and energy as well. Here are a few ways to organize yourself to be a better runner. Training for a race? Awesome! Organizing your runs to fit your schedule is a big part of a successful training cycle. By setting a training plan, you take the guesswork out of how many miles to run, and when to run those miles. Once your plan is set, you don’t have to worry about that aspect and you can focus all your energy on completing the assigned run for that day. For my marathon training I also printed out my training plan and attached it to my monthly calendar as a constant reminder to get my runs done! I’m still a pen to paper type of gal, so that’s why I keep a training journal. I have used the Believe Training Journal the last two years. I’m a firm believer in logging your runs because it’s a great way to see progress. I know some people that even track their meals and running fuel. This way they can see what types of foods worked well for their runs. This is a fun part of running for me. I really love planning my race-day outfits, otherwise known as the flat runner. This is the perfect way to lay out all of your clothing for the race, along with your bib, running gear and fuel. This ensures that you do not forget anything that you need on race day. Are you an organized person? How do you organize your running schedule? The training plan is key! I love when Becky makes my training plan. It makes me feel so “together”! I can just look at it and do what she has plotted out. Definitely! I feel like the training plan really helps me because it’s once less thing I have to worry about. I used to keep a running log and then fell off the wagon with that. I could start that again too! For some reason I find that logging my runs helps me to stay on track! Ugh! I’ve got to start working on my training plan for my next half in March. This last one I just winged it really, I’d done a half 6 weeks earlier, wasn’t expecting a good finish time (but a good time). I use the Believe Journal too! For races, I often write down what I ate & when. I also use it as a journal — since my halfs are racecations, i’ll write down things like what restaurants we ate at. You never know when you might go back to an area! When I trained for my first half, I used a planning plan. 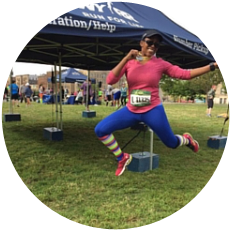 After that I didn’t use another training plan because I was doing half marathons so often – that was so silly of me! I will be using a training plan for my races moving forward. I love that you also log informaton for restaurants when you do your uncations – that’s an excellent idea! I like technology for a lot of things, but for some reason I am very old school when it comes to logging my workouts. there’s just something about writing down an achievement! I am not organized, let alone in running! I always try to log my miles on my calendar starting January 1st but come the summer I stop. maybe I need a running journal. I think the running journal is really great becauseyou get to look back on it month after month and see all that you have accomplished! You totally reminded me that I need to write out my training plan for Jan….eeek! I have always used Training Peaks or a google sheet to log my miles, but I might be more accountable to writing some my mileage using pen and paper! I am still trying to plan out my race calendar for 2017 so I’m a little behind this year! There’s just something about pen and paper. Technology is great but I love writing things down. So yeah… I feel you. Just a little bit of organization can go such a long way! Of course, there is also such thing as too much of a good thing… but I would rather my clients err a little on the side of caution at times! I am so very type A – I love having plannings. So I am currently really pissed that I am not sticking to any of my training plans. I am sure you relate to the current need to run. 100% agree with you Abby. I don’t feel as productive because I’m not following any type of plan. Hopefully that will change for both of us in 2017! Even though I make my own training plans, you are so right — filling it out on a spreadsheet ahead of time takes away the stress of making that daily decision. I also come back and fill in the results for each run and that helps me stay accountable. I sadly don’t feel as organized as I once was though. I think we all go through different degrees of being organized, but that’s okay! I was all about the stone tablet training log until I got The Inquisitor (aka my new Garmin 920XT). It’s all there whether I like it or not. So true. I kind of love and hate that my Garmin logs all my runs, but you have to take the good with the bad! Thanks so much for hosting the link up – I really love it! I think being an organized runner helps to relieve stress, especially on are day!